Occasionally, there comes a time when I have nothing to say. This morning is one of those. Usually there’s something in the course of a week that causes a tiny spark and you say, “Yup, I can write a little something about that,” and then you’re sorted for that week. A blog post will evolve. But some weeks – like this week – nothing gels or, sometimes, too many things gel such that you can’t nail one down. I’d be bluffing if I said this was one of those weeks. Nope, it’s a nothing week, really. The temptation, this morning, was clearly to write nothing at all for the blog. I’m writing quite hard on another thing so it’s not like writing would not be done. Plus nobody is going to give a flying feck if something turns up on the blog or not. It’s fine if it does and it’s equally fine if it doesn’t. The only person who cares is me. It’s a long standing part of my writing regime and if I don’t get it done, I’ve failed. I was going to write nothing but a creeping sense of laziness and failure has been rather spoiling my morning here and interfering with the myriad other things I have to get done. So, rather ironically, it seems that the only way I can get my important stuff done is to do this singularly unimportant stuff first. It’s an odd feeling. Typing a line and not really having a clue what the next line or paragraph will contain. I’m usually reasonably well ‘road-mapped’ out and I nearly always know where I’m going to end up. Not today, bud. But I’d like to keep on. I think it helps my other writing, this weekly collating of a thought or two into eight hundred semi-coherent words. It’s like lifting a small weight to keep a bicep in trim, except the muscle in question is the elusive writing muscle. I’ve been on one of my John Barry kicks this week. I think it’s a heady mixture that keeps me coming back. In one part, it’s obviously the wonder that is his film music but, on an equal footing, it’s the way his film music ties inextricably into my life and how it continues to evoke moments and memories from times when the music first played. 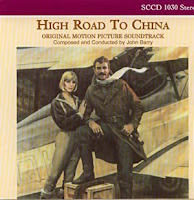 One of the stand out tracks, this week, was the end theme from ‘High Road to China’. I remember seeing it on the Friday Night Late Show in Sligo back when it first came out. I have little memory of the film but (am I projecting here?) I seem to remember a quiet satisfaction with the romance which the film contained. Listening to the music now, I can see how to feel that would have been almost unavoidable. Like his work for ‘Somewhere in Time’, John Barry often seemed to elevate the basic filmic material far beyond any place it could have ever got to without him. I’m currently plotting a thing. A writing thing. Everybody has different ways. For me, I can’t successfully plot until I start writing. I can do cards and matrixes and spreadsheets and wall charts and it’s all just for shite until I actually start writing. I must write something, anything at all, to get the process started. Then the jigsaw pieces start flying all over the place, multiplying, subtracting and, occasionally, satisfyingly, falling into place. It’s fine. I just wish I could remember this for the next time and stop trying to work everything out before I get going. I’ve wasted so much time trying to do that. I know it’s works for you but this is me here and I’m odd. For God’s sake, Ken. I’ve read everything there’s ever been written and I’m just champing at the bit come Sunday morning waiting for my fix of Ken Armstrong. Ah, if only. I’m a bit like you. I started off with good intentions and high hopes and now it’s a chore to get out of the road. I swear if Kass and Gwilliam stopped commenting I’d pack the whole lot in. I was close to it last year but then I started this poetry thing and the two of them started commenting and that cheered me up and so I’ve kept at it. I had intended to take a year off fully expecting I’d have my book done in six or seven months but here I am nine months into the year and still at it. I found a site where you can paste in your entire text and it will give you a list of unique words and it’s MOST revealing. We all know to look for certain words like ‘just’ or ‘that’ or ‘interesting’ but I was amazed to see how often I used words like ‘way’ or ‘people’ or ‘nothing’ and so I’ve been spending ages looking at some of the worst culprits and doing what I can to get rid of a few of them. I’m on ‘about’ at the moment (313 instances). It’s because I write as I talk and we all a bit slovenly in the way we speak. Anyway it needs to be done and then every now and then I’ll hear a phrase on the TV and want to paste it into the book. That’s when I don’t get distracted and start researching something like the phrase ‘turn around twice’ which I probably wasted half a day on and got nowhere. Well, not true. I added in a couple of words about Orpheus which no one will get but it pleased me. I only wrote today’s post last night. It’s not so bad for me. I just pick the next poem and try to think of something interesting to say about it without saying too much. This week’s was hard because I could write a novel about the events revolving around this wee poem but I’d rather not even though it would have far, far more chance of selling than the book I am working on. But it’s not me. Well, it’d be too much me and, oddly enough, I’ve never been one for pillaging my life for material. Not even the half-interesting stuff. That said after all these years whatever I wrote would be 95% fiction anyway. I was listening to an interview with Paul Auster yesterday and he was talking about so-called autobiographies. He said they’re all just novels masquerading as non-fiction. I’m glad you’re working. I’ve never imagined you ever not working. I just imagined you were like me and got on with it quietly. This is the most talkative I’ve ever been this year. Not like me at all. But then the book’s finished. This is just “tuttying up” to excavate an old expression of my dad’s for putting on makeup. I can’t plot to save myself. Not even when I’ve got a book going. I have an idea where I’m going but that’s it and only with Milligan and Murphy did I know how it was going to end and I actually wrote the last chapter out of sequence and worked towards it. Never ever done anything like that before. Not much I can think to say about John Barry. Dances with Wolves, Out of Africa and The Ipcress File jump out and, of course, the Bond theme. I, as you know, am a huge fan of film soundtracks—I have dozens upon dozens of them—but I’m not sure I have a favourite film composer. While I’ve been writing this I’ve been listening to Danny Elfman’s score to Fifty Shades of Grey. Wouldn’t touch the film with a bargepole but there are a lot of awful films out there with excellent soundtracks. This one’s pleasant enough but not his finest work. Okay, so I barely stand taller than the keyboard but I'm here, looking for you. :) And while blogs do seem to be going the way of the dinosaur, it's still where I turn to for conversations with people I enjoy....like yourself. One thing stuck with me, to this day, about that silly movie. Tom is piloting a plane and basically crashes. Stunned, he crawls out of the plane and sees an old Chinese man. He staggers toward him and asks, "Where am I?" To which the old man replies, "The ox is slow, but the earth is patient." If was such an unexpected response that Hubby and I laughed while everyone else scratched their head...like Tom. Later on it would become our code for, "is that guy/gal dumb or what?". I even cross stitched it and put it in a small frame in our house. I loved watching people read it, look puzzled and try to wander off without being seen. Those who understood how that one little sentence can sum up life, would nod and smile. I always read, Ken. Usually on a Monday when I get emailed my subscription but occasionally I'm around for the "first edition". Is It Growing On Me or Am I Shrinking Into It?